We are excited to announce our new PJ Library partnership! 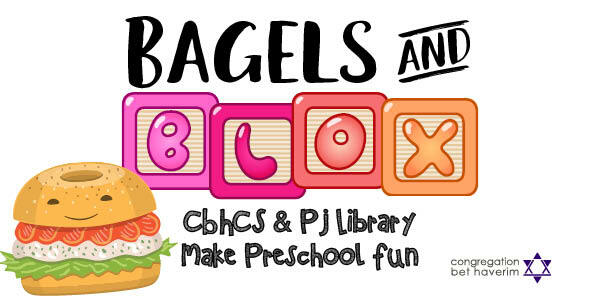 The CBH Community School, in collaboration with PJ Library, will be offering our new “Bagel & Blocks” program: Four fun, sensory programs for children ages 3-4, which will take place during our Sunday school program. Each program is 1 hour long, and will be a fresh and experiential take on traditional Jewish themes, values, and knowledge. These events are completely free and open to preschool/pre-K children in and outside of the CBH community. Feel free to bring a friend! And parents, we haven’t forgotten you! This is also a fantastic opportunity to meet other parents of young children. At the end of each program, you’ll leave with resources to guide you in continuing what your child learned about at home. If you have any questions, feel free to reach out to Kate Hennessey, CBH’s Director of Education, at education@cbhatlanta.org or 404-315-6446. Please email or call for our exact meeting location!